Songbirds learn their songs and perform them using a specialized voice box called a syrinxSEE-rinksthe bird voice box, located at the branch point between the trachea and bronchi and containing vibrating tissues called labia, in songbirds capable of making two sounds at once via independent muscle control. Vocally, they’re in a league of their own. These adaptations have been remarkably successful—songbirdsa species from the oscine (ah-SEEN) group of passerine (PASS-er-een) birds, songbirds (including sparrows, thrushes, and warblers) have a specialized voice box called a syrinx that can produce complex sounds, songbirds must learn their songs rather than developing them instinctively make up almost half of the world’s 10,000 bird species including warblers, thrushes, and sparrows. The vast majority of non-songbird species make simpler sounds that are instinctual rather than learned. For a bird, singing can be draining. It is both energetically expensive and alerts predators. So then why do birds sing? 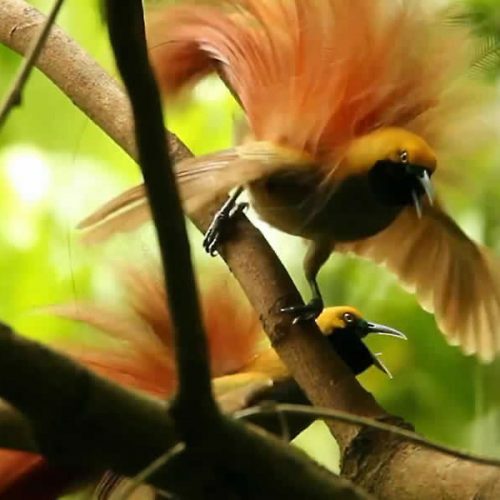 Evidence suggests that in part, it is to proclaim and defend their territoriesin birds, the areas defended by males, pairs, or families as dedicated nesting sites and/or foraging areas. Studies have also shown that songs play a crucial role in attracting and impressing potential mates and may signal the overall health of the singer. As in humans, singing in birds is often a chance to show off. Why are some bird sounds referred to as songs and others as calls? Typically a song is defined as a relatively structured vocalization produced while attracting a mate or defending a territory. Calls tend to be shorter, less rhythmic sounds used to communicate a nearby threat or an individual’s location. Each species and individual has a variety of songs and calls used in different contexts that together make up its repertoirethe full range of sounds that an animal makes, each used in context to communicate specific messages. While the distinction between calls and songs is not always clear, it can be quite ear opening to explore the full repertoires of your favorite songbirds. Chances are when you hear a bird singing it’s a male. The majority of female songbirds in temperate zones use shorter, simpler callsin birds, a short simple vocal sound most often made to keep in touch and alert other birds while the males produce the longer and more complex vocalizations we think of as songin birds, a relatively complex learned vocalization that functions in mate attraction and territory defense. 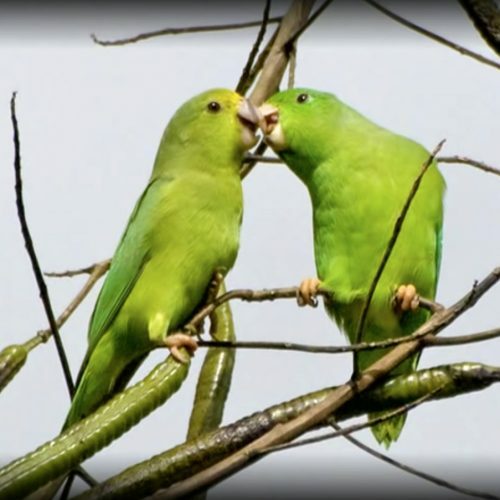 The story is different in the tropics where females commonly sing, and many species engage in duettingin birds, a coordinated set of vocalizations most often made by male-female pairs to maintain and strengthen their pair bond, more common in the tropics. The songbird syrinxSEE-rinksthe bird voice box, located at the branch point between the trachea and bronchi and containing vibrating tissues called labia, in songbirds capable of making two sounds at once via independent muscle control makes vocal gymnastics possible–for example the Northern Cardinal (Cardinalis cardinalis) is a able to sweep through more notes than are on a piano keyboard in just a tenth of a second. Because each branch of the songbird syrinx is individually controlled, the cardinal can start its sweeping notes with one side of the syrinx and seamlessly switch to the other side without stopping for a breath, making them the envy of human vocalists everywhere. Unlike humans, birds produce vocal sounds using a syrinxSEE-rinksthe bird voice box, located at the branch point between the trachea and bronchi and containing vibrating tissues called labia, in songbirds capable of making two sounds at once via independent muscle control, an organ located where the trachea splits into two bronchial tubes. In songbirds, each side of the syrinx is independently controlled, allowing birds to produce two unrelated pitches at once. Some birds even have the ability to sing rising and falling notes simultaneously, like the Wood Thrush (Hylocichla mustelina) in its final trill. We can only imagine what musical heights human vocalists could reach with abilities like that. While some birds hatch knowing the songs they will sing as adults, the true songbirdsa species from the oscine (ah-SEEN) group of passerine (PASS-er-een) birds, songbirds (including sparrows, thrushes, and warblers) have a specialized voice box called a syrinx that can produce complex sounds, songbirds must learn their songs rather than developing them instinctively have to learn how to communicate effectively. Songbirds begin learning their songs while still in the nest, a phase known as the critical periodin songbirds, the time as a nestling during which the bird is most sensitive to learning the sounds of nearby birds, when nestlings listen to the adults singing around them. Following fledging, young birds attempt to replicate these songs, practicing until they have matched their tutor'sin songbirds which do not develop their songs instinctively, one of the adults that a young bird listens to as a nestling and models its adult song on song. Some songbirds, such as the catbirds, thrashers, and mockingbirds, learn to mimic other species—frogs, cats, and even car alarms. Just as humans have regional accents, some bird species develop distinct, area-specific dialectsa unique set of sounds made by a subpopulation of animals of the same species. 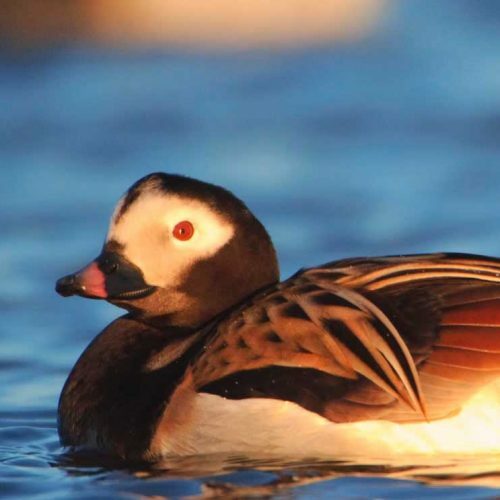 Such variation in song often arises when populations of the same species are isolated by geographic features such as mountains, bodies of water, or stretches of unsuitable habitat. These local dialects are then passed on to the next generation of young birds, which hear the songs being performed by their father and other local males. After many generations, the birds from one area can sound quite different from those the next mountain over. Birds are often up before dawn singing their hearts out and adding their voices to the dawn chorusthe early morning singing event that songbirds from a variety of species participate in near sunrise, thought to help maintain male territories. But why do many species sing more intensely at dawn than they do at any other time of the day? Many of the songs heard at dawn are thought to function as warnings given by male birds in defense of their territory and mate. While the dawn chorus is a common phenomenon wherever birds live, little is known about why birds concentrate their efforts during these early hours. 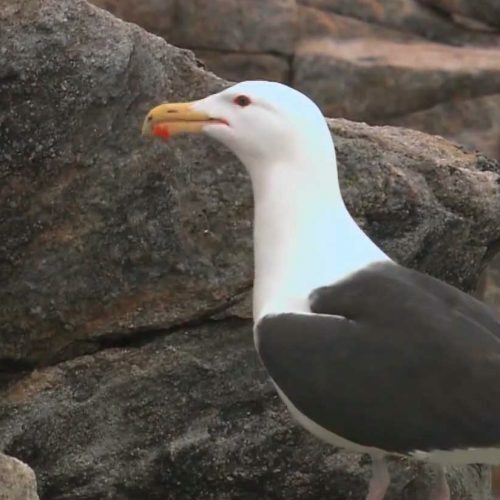 Enjoy up-close portraits of birds in song with this interactive video collage. Recommended citation: Cornell Lab of Ornithology. 2014. Bird Song. All About Bird Biology . Cornell Lab of Ornithology, Ithaca, New York. .